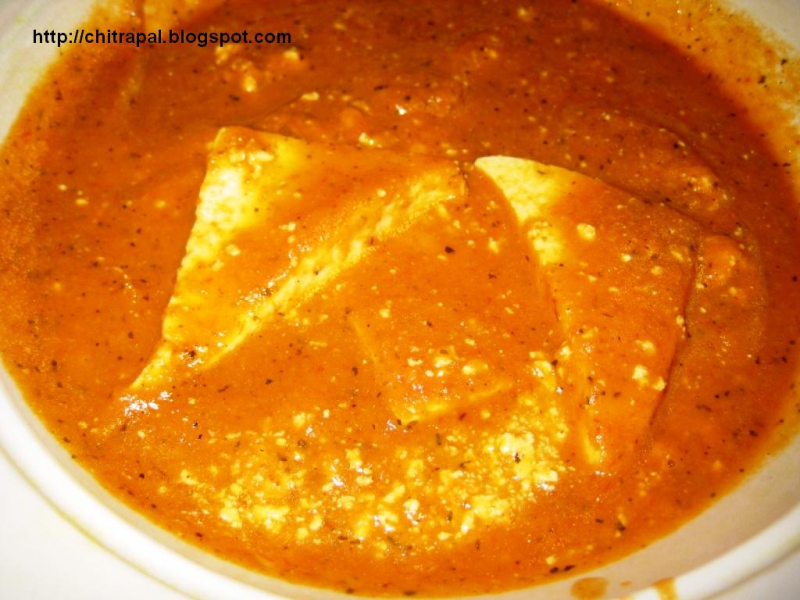 Puree the Tomatoes in a blender and cut the paneer in triangle pieces. In a non stick pan heat the vegetable oil with butter. (If you will heat the butter alone it tends to burn soon). Add the bay leaf and cloves. When they change little color add ginger garlic paste. Let the garlic cook for two minutes. Add Onion paste and sauté till light brown. Add salt and chili powder. Add tomato puree, tomato ketchup, crushed kasuri methi, coriander powder, turmeric powder, garam masala. Now add the cashew paste and fry for two minutes. Add a small cup of water and let it cook on medium heat till you get the desired curry consistency. Stir and let it simmer for some time with closed lid. Add the paneer and simmer for 2-4 minutes on low heat. Serve the Butter Paneer Masala with Naan (Indian flat bread) or zeera / steamed rice. TIP :- To puree the onions for tadka :- Skin the onions and blanch them in hot water for 3 - 4 mins then puree them to form a paste. It will give good paste rather dry oinions.